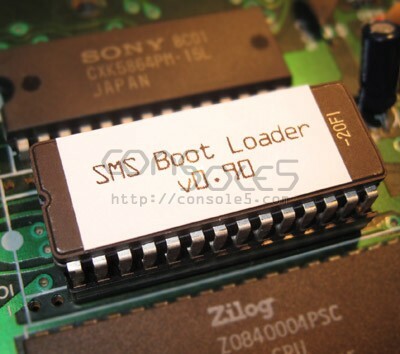 Bock's SMS Boot Loader 28-pin BIOS and socket. This kit contains a replacement 28-pin BIOS EPROM and EPROM socket for the original Sega Master System (not the redesigned SMS2). This BIOS bypasses region checks and allows you to choose which port to boot SMS software from, Cartridge, Card, or Expansion. This BIOS only works with 837-6629 revision PCBs. Most SMS are 837-6629, if your SMS has built-in games, it is almost certainly a 837-6629. If you have an 837-6067 PCB, your SMS will not have a built in game. Powering it up without a cartridge will present a screen asking you to power off the console and insert a game. We offer an experimental version for 837-6067 PCBs - please see the related products. It has the advantage of not checking any country code or header, so basically it is possible to boot up an original Japanese mycard game (for SG-1000 or Mark III) on your US or European Master System 1. You can also use it to boot Brasilian 8 megabits games which are not supported by all models of Master System 1. Last but not least, using a homemade pinout converter, it would be possible the same way to boot up any SG-1000/SC-3000 or Mark III/SMS cartridge.